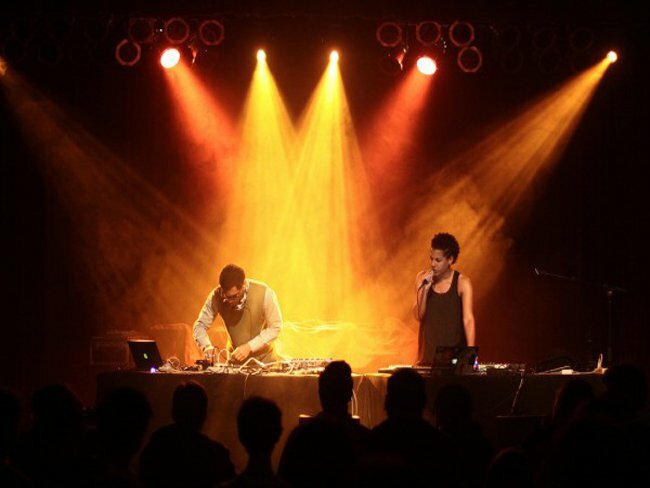 "Ableton Live is the wheel of our production hub and we're the spokes," says Saturn Never Sleeps member Rucyl, who forms the group with partner King Britt. It's an appropriate metaphor for a project like SNS, who use multiple hardware, software, and acoustic instruments (not to mention Rucyl's arresting voice) in their productions. Live is the flexible tool that allows for communication between the instruments - and between King and Rucyl. "I can create all of my own sessions and easily combine them with King's," says Rucyl. "I'll take his sketches and pull them into a new session and add whatever I need to, using my personal settings and effects racks." When writing, SNS improvise together with Live sets, which eventually form finished tracks. This setup allows them to record inspiration virtually anywhere that it strikes. "Many ideas [on the album] came from our special sonic palette we created for our live improv sets," explains King. "Other ideas came from jamming in hotel rooms with headphones. 'Bit by Bit' was totally created in this manner." King describes Ableton Live as the "center of the show" for Saturn Never Sleeps. "Live allows you to actually sit and think about what your ultimate setup would be - and then it has all the tools to create it," he says. Both King and Rucyl use custom templates in Live, with King focusing more on beats and instruments, and Rucyl using Live to loop and sample vocals and other textures. Rucyl can get spontaneously creative with Live: "I'll play with tempo and go crazy with layering and side-chaining effects," she says. Fittingly for their moniker, Saturn Never Sleeps show no signs of slowing down. Their new album, Yesterday's Machine, is currently available for free download from the SNS blog.